Gas fireplaces can only be installed on outside walls of the home, right? WRONG! While that was the case several years ago, technology has come a long way since then. Direct Vent gas fireplaces require outside air for combustion and exhaust – that’s why they are so often installed on outside walls of homes. But what if that perfect spot for a fireplace is on an interior wall? No problem! Power Venting technology makes it possible by simply pulling outside air to the fireplace, while exhausting the fire’s byproducts to the outdoors through the venting system. 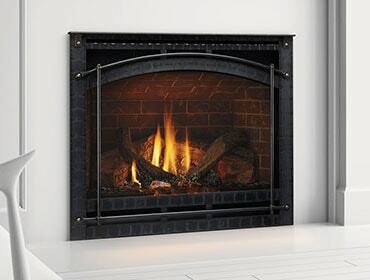 Essentially, Heatilator’s Power Venting technology is a sleek fan-powered accessory with slim venting that can zigzag through your home’s walls – up, down, over or under – making it possible to install a direct vent gas fireplace almost anywhere. The Power Vent can installed in-line within the venting system, or where the vent terminates outside your home. We produced a video that explains in more detail how the Power Vent works. Watch it here. Check with your local Heatilator dealer to determine if your fireplace installation could benefit from Power Venting technology. From all of us at Heatilator, enjoy the fire (anywhere in your house)!